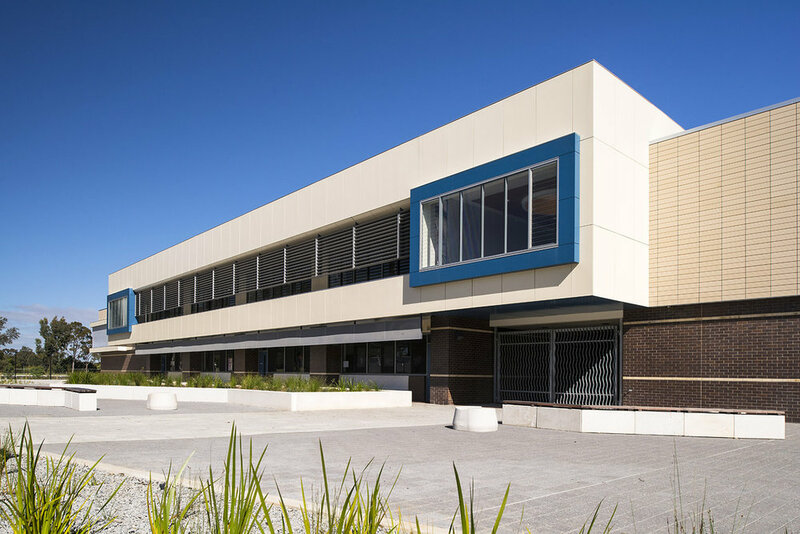 The new Governor Stirling Senior High School Redevelopment in Woodbridge replaces the existing school with a modern facility. Opening in 2013 at a cost of $60M it was the first full redevelopment of senior high school constructed in a single stage in WA. The 4.6tha site is culturally and historically significant being adjacent to the Aboriginal ‘sacred’ Swan River and part of Western Australia’s founding Governor’s estate; James Stirling and The National Trust owned ‘Woodbridge House’. The design provides an adaptable state-of-the-art facility that caters for a school population of 1000 students, Years 8-12. The design maximizes the relationship between building and river and the surrounding context to create a sense of place. The two-storey entry foyer/gallery connecting the Administration and Performing Arts is located adjoining the river to provide the visitor an appreciation of the unique river setting upon arrival and provides an uplifting and welcoming public face to the school. Views between the buildings connect the courtyards to the surrounding context in all directions. Governor Stirling Senior High School was opened by the premier of Western Australia, the Hon Colin Barnett.